PAWTUCKET – The Pawtucket Police Department and Cops for Kids with Cancer, a nonprofit charitable organization, made the holidays a little brighter for a local family on Friday, as they presented a woman and her daughter – who was diagnosed with leukemia – with a check for $5,000 during a ceremony at City Hall. 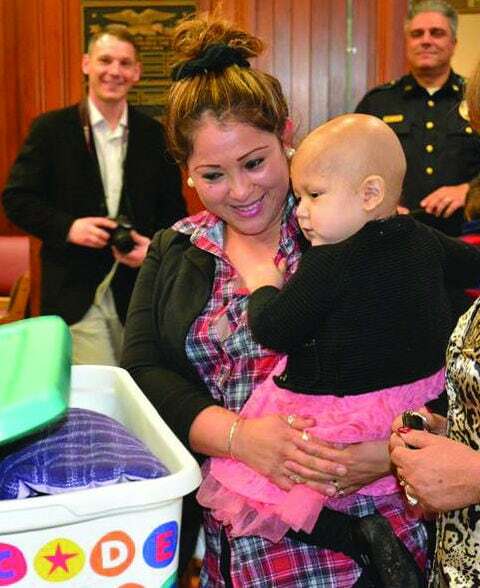 Twenty-month-old Briana Leon in July was diagnosed with leukemia. She has been receiving treatments at Hasbro Children’s Hospital and her mother Sandra had to quit her housekeeping job to stay home and care for her daughter as she undergoes treatment. For complete story, see Saturday’s print edition of The Times. To inquire about daily home delivery, call us at (401) 767-8522.